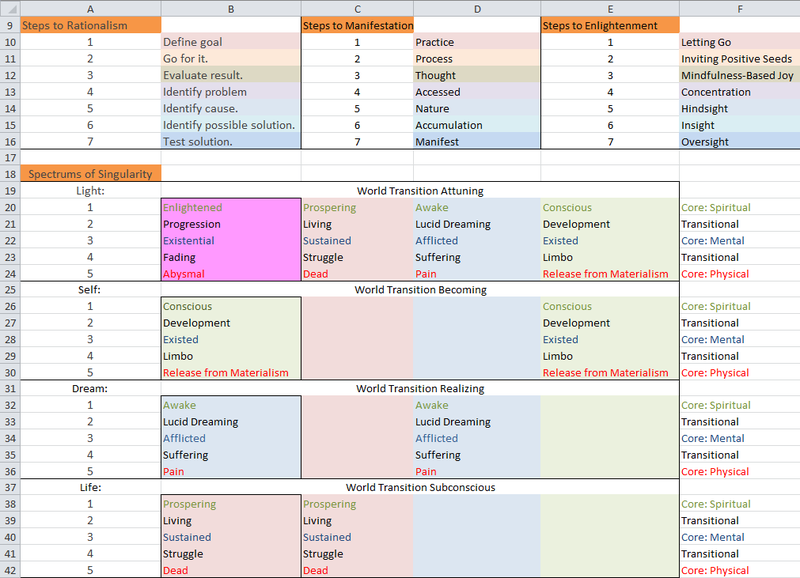 Living Fields Spectrums and Steps to Rationalism. The purpose of the three colors is to practice the separating of spectrum. So we can differentiate the different components and variables to any system. The mechanical parts is made of the body, mind and spirit. These are the machines of life; The physical, mental and spiritual. The collective system is religion, ideology and humanism. I have not explained the fourth column yet and that is of “Ascended” values. These values protrude the diagram in a dimension we are not familiar with because it is in a different plane. Body, mind and spirit are on a linear plane whereas light protrudes the diagram going upwards combining all three body, mind and spirit. The ascended 4th value is where we want to be looking to; Light is the mechanical part, Deva the machine and the collective system of ideas is an ideology, but not just any virtue: “Divine Benevolent Virtues” the cleanest rational way of categorizing behavior, nature and ideologies. What is important in my work is that in “Practice” through “Process” can bring thought which leads to ideas “Accessed” to become “Nature” and “Accumulate” to “Manifest” through the steps to Manifestation. First you would define the goal. Second, go for it. Third, Evaluate the results. Fourth, Identify the problem. Fifth, Identify cause. Sixth, Identify possible solution. Seventh, test the solution. This is the showcase and paradigm of the colored spectrum labeled to show you the intensity and level of life, dream, self and light. In the study of levels of living fields under Spiritual Aspects, the action Consciousness, it’s behavior is Soul Manifestating through the field of Benevolent Field. The action Creative Leaps, has a behavior of Spirtual Expression through the field of Benevolent Field. In the study of levels of living fields under Mental Aspects, the action Sphere of Influence, it’s behavior is Mental Compounding through the field of Morphic Resonance Field. The action Organizing Principles, has a behavior of Wired Manipulation through the field of Spectrum Accessing Field. In the study of levels of living fields under Physical Aspects, the action Nature/Habits, it’s behavior is Physical Nature through the field of Activity Field. The action Natural Selection, has a behavior of Crude State through the field of State Field. ← The Plot Thickens: Your Mind has Been Hi-Jacked.